Bhojpuri (Devanagari: भोजपुरी listen ) is an Indo-Aryan language spoken in the Bhojpuri region of North India and in Madhesh, Nepal. It is chiefly spoken in the Purvanchal region of Uttar Pradesh, in the western part of Bihar state, and in the northwestern part of Jharkhand in India. Bhojpuri is one of the national languages of Nepal, Trinidad and Tobago, Guyana, Fiji and Suriname. Bhojpuri is also spoken in Pakistan, Bangladesh, Mauritius, Jamaica, the Caribbean in general, and South Africa. The variant of Bhojpuri of the Indo-Surinamese is also referred to as Sarnami Hindustani, Sarnami Hindi or just Sarnami and has experienced considerable Sranan Tongo Creole and Dutch lexical influence. More Indians in Suriname know Bhojpuri. In Mauritius a dialect of Bhojpuri remains in use, and it is locally called Bojpury. Bhojpuri speaking region is bounded by the Awadhi-speaking region to the west, Madhesh to the north, Magahi- and Maithili-speaking regions to the east, and Magahi- and Bagheli-speaking regions to the south. Bhojpuri was historically written in Kaithi scripts, but since 1894, Devanagari has served as the primary script. Kaithi script was used for administrative purposes in the Mughal era for writing Bhojpuri, Awadhi, Maithili, Urdu, Magahi and Hindi from at least the 16th century up to the first decade of the 20th century. Government gazetteers report that Kaithi was used in a few districts of Bihar through the 1960s. Bhojpuri residents of India, who signed up and moved as indentured labour in Africa and the Caribbean colonies of the British Empire in 19th century and early 20th century, used Kaithi as well as Devanagari scripts. By 1894, official texts in Bihar were written in Kaithi and Devanagari. At present almost all Bhojpuri texts are written in Devanagari even in the overseas islands where Bhojpuri is spoken. For example, in Mauritius, both Kaithi and Devanagari scripts have been in use since the arrival of Bhojpuri people from India. The Kathi script was considered informal in Mauritius, with the structure of Kaithi similar to Devanagari (spelled Devanagri in Mauritius). In modern Mauritius, Bhojpuri script is Devanagari. Bhojpuri is, sociolinguistically, one of the seven Hindi languages (Haryanvi, Braj, Awadhi, Bhojpuri, Bundeli, Bagheli and Kannauji). Of these seven, Bhojpuri has the most allophonic variations in vowels. Robert Trammell has published the phonology of Bhojpuri. Bhojpuri has six vowel phonemes, and ten vocoids. The higher vowels are relatively tense, while lower vowels are relatively lax. The language has 31 consonant phonemes and 34 contoids (6 bilabial, 4 apico-dental, 5 apico-alveolar, 7 retroflex, 6 alveo-palatal, 5 dorso-velar and 1 glottal). According to Trammell, the syllable system is peak type: every syllable has the vowel phoneme as the highest point of sonority. Codas may consist of one, two or three consonants. Vowels occur as simple peaks or as peak nuclei in diphthongs. The intonation system involves four pitch levels and three terminal contours. Bhojpuri syntax and vocabulary reflect a three-tier system of politeness. Any verb can be conjugated as per these tiers. For example, the verb "to come" in Bhojpuri is "aana" and the verb "to speak" is "bolna". The imperatives "come!" and "speak!" can thus be conjugated five ways, each marking subtle variation in politeness and propriety. These permutations exclude a host of auxiliary verbs and expressions which can be added to these verbs to add even greater degree of subtle variation. For extremely polite or formal situations, the pronoun is generally omitted. Similarly, adjectives are marked for politeness and formality. For example, "your" has several forms with different tones of politeness: "tōr" (casual and intimate), "tōhār" (polite and intimate), "t'hār" (formal yet intimate), "rā'ur" (polite and formal) and "āp ke" (extremely formal). The known dialects, per world language classification system, are Bhojpuri Tharu, Domra, Madhesi, Musahari, Northern Standard Bhojpuri (Basti, Gorakhpuri, Sarawaria), Southern Standard Bhojpuri (Kharwari), and Western Standard Bhojpuri (Benarsi, Purbi). Southern Standard Bhojpuri is prevalent the areas of Bhojpur, Rohtas, Saran, Bhabua, Buxar, Siwan, Gopalganj in Bihar, and Ballia and eastern Ghazipur in Uttar Pradesh. It is sometimes referred to as ‘Kharwari’. It can be further divided into 'Shahabadi' and 'Chapariyah'. 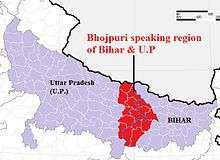 Northern Bhojpuri is common in the areas of Deoria, Gorakhpur and Basti in Uttar Pradesh, north Bihar and Nepal. Local names include ‘Gorakhpuri’ for the language in Deoria and eastern Gorakhpur, and ‘Sarwariya’ in western Gorakhpur and Basti. The variety spoken cast of Gandak river between Gorakhpuri Bhojpuri and Maithili in Champaran has a local name Pachhimahwa. Northern Bhojpuri has Maithili influence. Western Bhojpuri is prevalent the areas of Varanasi, Azamgarh, Ghazipur and Mirzapur in Uttar Pradesh. ‘Banarasi’ is a local name for the Banaras Bhojpuri. Western Bhojpuri is also referred to as "Purbi" or "Benarsi". Nagpuria Bhojpuri (not to be confused with Nagpuri) is southern most dialect, found in Chhotanagpur region of Jharkhand, particularly parts of Palamau and of Ranchi. It has more Magahi influence. It is sometimes referred to as 'Sadani'. Bhojpuri has a population of more than 10 crore native speakers in India alnoe. Thus Ravikant Dubey has petitioned that Bhojpuri be one of the official languages of India. For cultural reasons, it is usually seen as a dialect of Hindi. Due to the persistent demand from Bhojpuri language activists to recognise it as an official language, P Chidambaram, Home Minister, Government of India announced to Lok Sabha speaker a few lines in Bhojpuri : "hum rauwa sabke bhavna samjhatani (I understand your feelings)", proposing to include Bhojpuri in 8th Schedule of the Constitution and accorded the official status. Lorikayan, or the story of Veer Lorik, is a famous Bhojpuri folklore of Eastern Uttar Pradesh. A modest number of novels have been published in Bhojpuri since 1956. Many Bhojpuri magazines and papers are published in Bihar, Jharkhand and Uttar Pradesh. Parichhan is a contemporary important literary-cultural Maithili-Bhojpuri magazine, published by Maithili-Bhojpuri academy, Delhi government and edited by Parichay Das. Parichay Das is pathbreaker poet, Essayist, Critic, editor in Bhojpuri. He was Secretary, Hindi, Maithili-Bhojpuri Academy, Delhi Government. The Sunday Indian, Bhojpuri is a regular national news magazine in Bhojpuri published by Planman Media, owned by Prof. Arindam Chaudhary and edited by Onkareshwar Pandey. Aakhar is a monthly online Bhojpuri literature magazine. It is published by Sanjay Singh, Shashi Mishra, Navin Kumar and designed-edited by Ashwini Rudra. Other media in Bhojpuri include Lok Lucknow, Mahuaa TV and Hamar TV as Bhojpuri language channels, and a weekly paper in Bhojpuri published from Birgunj, Parsa of Nepal whose publisher is Dipendra Prasad Kanu. In Bangladesh, there are also Bhojpuri-speaking Muslims. However, their total number is estimated to be smaller than the number of Bhojpuri speakers in Mauritius, African, Caribbean, and South American nations. Bhojpuri is a major language spoken in Nepal with official status. Bhojpuri is also spoken by people who were brought as indentured labourers in the 19th century and early 20th century, for work in sugarcane plantations during British colonial era, to Mauritius, Guyana, Suriname, Fiji, the Caribbean, Trinidad and Tobago, Jamaica, and South Africa. ↑ Hammarström, Harald; Forkel, Robert; Haspelmath, Martin; Bank, Sebastian, eds. (2016). "Bhojpuric". Glottolog 2.7. Jena: Max Planck Institute for the Science of Human History. ↑ Ethnologue's detailed language map of western Madhesh; see the disjunct enclaves of language #9 in SE. ↑ "'Recognition' of Bhojpuri sought". The Times Of India. 23 January 2012. Retrieved 20 July 2012. ↑ "Chidambaram speaks a surprise". Chennai, India. The Hindu. 17 May 2012. Retrieved 5 June 2012. ↑ Traditions of heroic and epic poetry - Google Books. Books.google.co.in. 4 December 1969. Retrieved 27 February 2014. ↑ "Archived copy". Archived from the original on 5 March 2016. Retrieved 2016-03-13. ↑ "Archived copy". Archived from the original on 25 February 2015. Retrieved 2009-12-10. ↑ "Forced Labour". The National Archives, Government of the United Kingdom. 2010. Kaipuleohone has archived open access recordings of Bhojpuri.